It has been a wonderfully busy week, hasn’t it? Gameplay preview tours from across the world have concluded, and you’ve been on the receiving end of a healthy drop of brand-new Halo 5: Guardians content over the past few days. You’ve seen a look at new cinematics, Campaign gameplay, developer interviews, and just today, a sizeable amount of Arena goodness, with brand-new multiplayer gameplay previews. We hope that you like what you’ve seen so far, and whether the footage makes the wait shorter or longer, that you’re excited to play in just over 30 days. 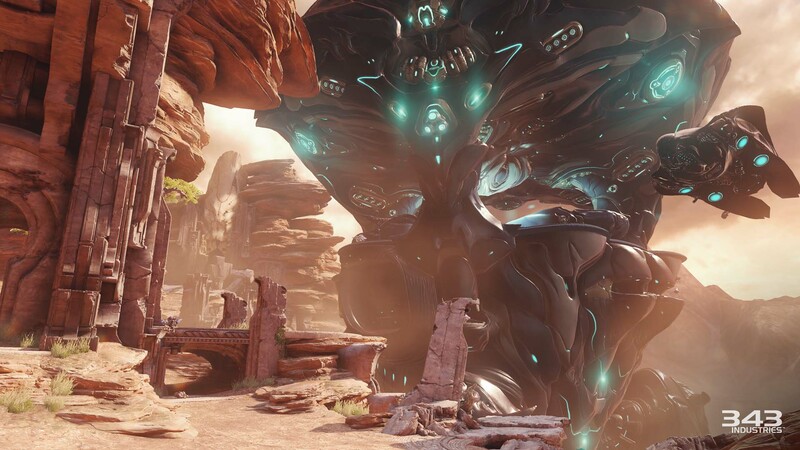 Our friends Fenris447 and Unyshek from the Halo subreddit took the time to put together some discussion mega-threads for this week’s Campaign footage and reviews, and also today’s Arena drop. Chances are that you’re still catching up on gameplay videos, and truth be told we are as well, so we're quite thankful that these fine folks took the time to compile these mega-threads. If you’re looking to get up to speed on everything from this week, these well-organized threads are a fantastic place to start. Now that you’ve bookmarked all of the videos and articles you’d like to delve into, let’s get a closer, behind-the-scenes look at some of the new things you saw this week, straight from the folks who created them. We’ll kick things off with Blue Team. You’ve now seen the introduction to both Blue Team and Fireteam Osiris. For the Osiris opening cinematic, we grabbed some production commentary (which you can check out here), so it felt appropriate that we also dive into what it took to create Blue Team’s opening. Today, we’ll hear from Cinematic Animator Matt Campbell. Being a huge Halo fan, I was thrilled when I got the opportunity to be the animator for the Blue Team cinematic. The opportunity to showcase Chief’s legendary team (for the first time in a Halo game) was a challenge I was more than willing to embrace. 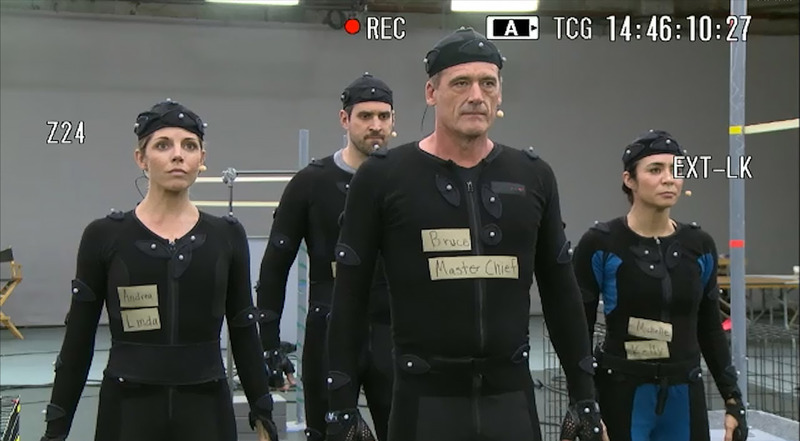 This was going to be the first time we saw Chief and Blue Team in the game, so we knew it had to be a powerful moment. We also wanted to create a moment that felt different than our opening cinematic – featuring Fireteam Osiris. 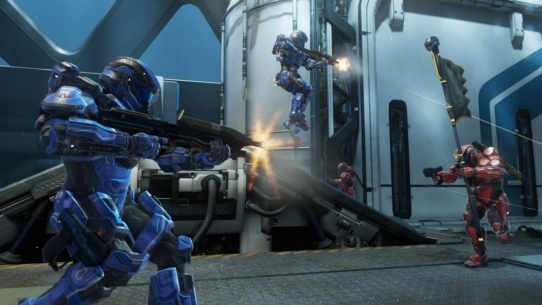 Blue Team is a highly efficient, close-knit group of Spartan-II soldiers. Unlike Locke’s team, the members of Blue Team have participated in hundreds of combat missions together. That war-forged experience led to an unbreakable bond that we wanted to embrace and showcase in order to create a sense of contrast between the two squads. The scene presented some unique challenges: “How can I make a group of faceless heroes feel like family members?” We set out to construct these very small and intimate moments for Chief and his team, like Chief's interaction with Fred. Something as simple as a nod or glance really had to read just right. Of course I also had to consider, “How can I make them feel more tactical and efficient on the battlefield?” because at the end of the scene, we have to jump back into action. We talked a lot about the Blue Angels squadron, and how they fly in formation, incredibly in sync, all knowing exactly where each member of the team is and what purpose they have moment to moment. 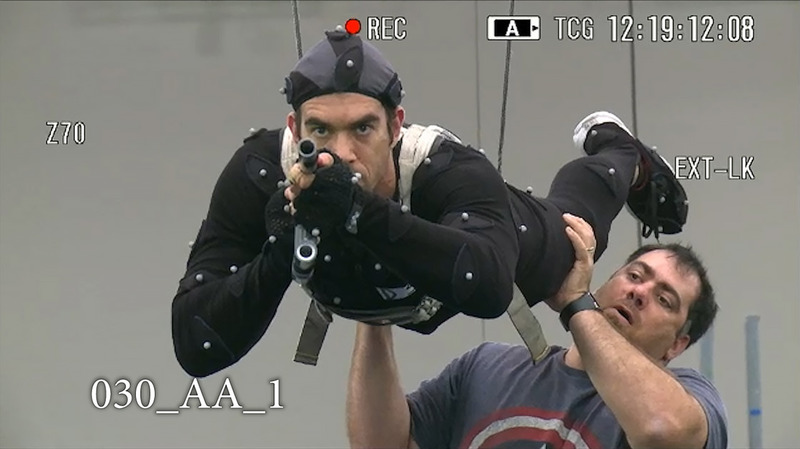 In the end, we really just loved how everything came together - the incredible environments, FX, lighting, character models. And big props to our audio team. They did an amazing job. I hope the fans really enjoy it. Here’s a look at a few pictures and images from our process. Let’s switch gears to the other side of the story. On Wednesday at midnight pacific time, one of the campaign missions that filled your social timelines was Enemy Lines, which follows Fireteam Osiris on a daring mission to recover a Forerunner Constructor hidden beneath the war-torn surface of Sanghelios. Fighting alongside the Arbiter’s forces, you will have to break into a Covenant encampment guarded by fanatical warriors, dodge plasma cannons in an ancient temple complex, and then face off against the Kraken – a massive siege platform that can only be taken out with a combination of air power and close-range combat. If you haven’t yet watched some of the gameplay, you can head to our friends over at ReadyUpLive, Halo.fr, and more at the aforementioned campaign megathread. Now that you’ve seen some gameplay, we’ll hear from World Lead TJ Perillo, Senior Designer Chris French, Lead Animator JuanCarlos Larrea, and Lead World Artist Nicholas Bell on the mission design and art of Enemy Lines. Enjoy, friends. When we were first kicking around ideas for the Sanghelios missions, there was a lot stewing in the pre‑production cauldron. New heroes. New abilities. New commitments to co-operative play, exploration, and open-ended gameplay. That’s a lot to account for when creating new content, and it’s gotta be bigger, better, faster, and funner (funner?) than anything we’ve done to date. So we took a feet-first orbital drop onto Sanghelios to see what we could stir up. 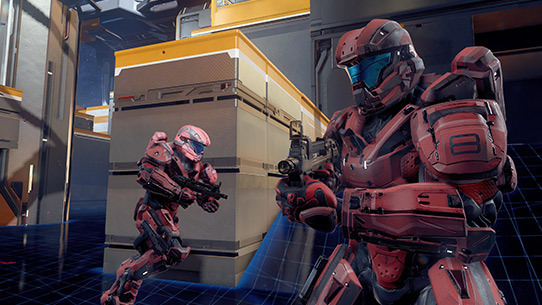 Enemy Lines was our first foray into what’s new with Halo 5, and we went big. We envisioned this mission as a kind of rollicking escapade – high adventure, rife with opportunities for swashbuckling derring-do: narrow escapes, aerial boarding maneuvers, jungle gym battlefields - challenges where bravado and flamboyance are called for and rewarded. Just the thing to put players squarely in the tungsten carbide boots of Fireteam Osiris. Art, Design, and Narrative came together and cooked up a cool backdrop: crisscrossing forbidden ruins along the frontlines of a war you have no stake in. Awesome. Meanwhile we iterated for months on the Temple Grounds combat space, aka “the big bowl.” This was our petri dish for combat with the new Spartan abilities. The lessons learned there were propagated out to the other combat spaces and on to the rest of the game. And we summoned the Kraken – a new Covenant command-and-control platform that hovers on the periphery of battle and offers limited close support. It’s massive, but it’s also a bit elusive. It tries to keep you at arm’s-length while it watches and directs. It’s practically begging to be boarded and scuttled. In addition to serving as a command-and-control platform, the Kraken just happens to serve as an excellent playground for vertical take-off and landing aircraft. And our new Forerunner Phaeton just happens to be such a vehicle. The Kraken is round and tall, bristles with weapons and targets, and fields its own air force. And its legs and canopy struts provide great air cover. It’s also porous – many ways in, through, and back out. Maybe leave some breadcrumbs while you’re in there. You miiight be exiting in a hurry. Another cool thing about Enemy Lines is the blending of gameplay and spectacle. Big moments that, in games past, might have been non-interactive backdrops are now creeping into gamespace in ways that will keep players on their toes. As the kind of Halo player who likes to dive headlong into trouble and challenge myself to find a way out, I love this. I love new surprises, being a bit unsure, having to react and improvise. Halo sandbox at its best. So by the end, the new features and commitments from pre-production didn’t just find their place in our content creation toolkit – they were indispensable. We simply couldn’t do missions like Enemy Lines without them! The missions of Sanghelios happen to fit together geographically, and most of Enemy Lines takes place on a high plateau, relative to the other missions. This is the origin of Enemy Lines’ development name: Plateau. The Kraken was known as the Sentry Ship during development, owing to its combat role – a looming watcher. Enemy Lines was the Campaign Vertical Slice mission – an internal proof-of-concept that the studio used to drive development and prove out big bets. As such, it was the first fully playable Halo 5 mission. The ‘Big Bowl’ combat space is where, early on in production we needed to prove out having a very large encounter with multiple paths and tiers the player could fight through. 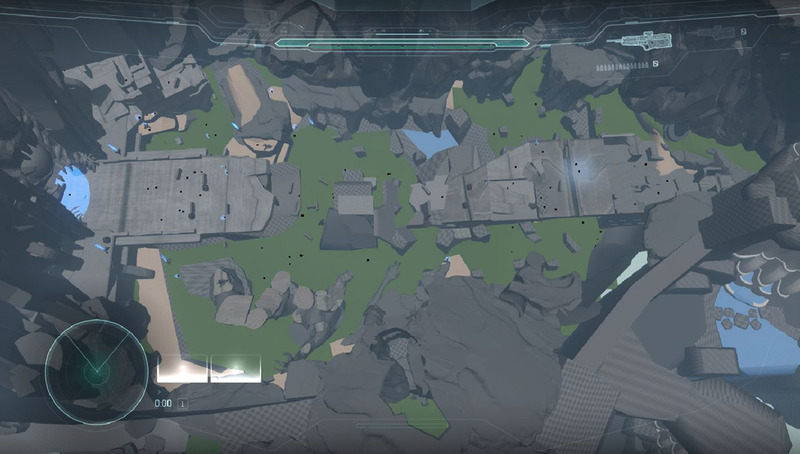 It needed to be a showcase for Halo’s open level sandbox. We wanted to show off the new Spartan abilities and how they are useful in a major sandbox encounter. We also needed to get the AI engagement metrics feeling good in a huge space while not overwhelming and frustrating the player. ‘Big Bowl’ went through a lot of growing pains and iteration to get the metrics of the encounter to feel right. One of the first things we did in this space was to isolate this one giant encounter space into two large symbiotic encounters. This allowed us pace out the fight with a slight break in the middle and allow the front half AI to adjust to the choices and actions the player made early on. We spent a lot of time fine-tuning sight lines and secondary routes to allow as much freedom for the player as possible and just let the player engage in the Halo sandbox anyway they would like. We learned a lot from this encounter space and we used this knowledge to build other large spaces throughout the campaign. The Kraken had many challenges. Think of it being about the size of a very small level moving within another level. It needed to be big enough to allow combat on and in it, and it needed even bigger areas where it could move through. 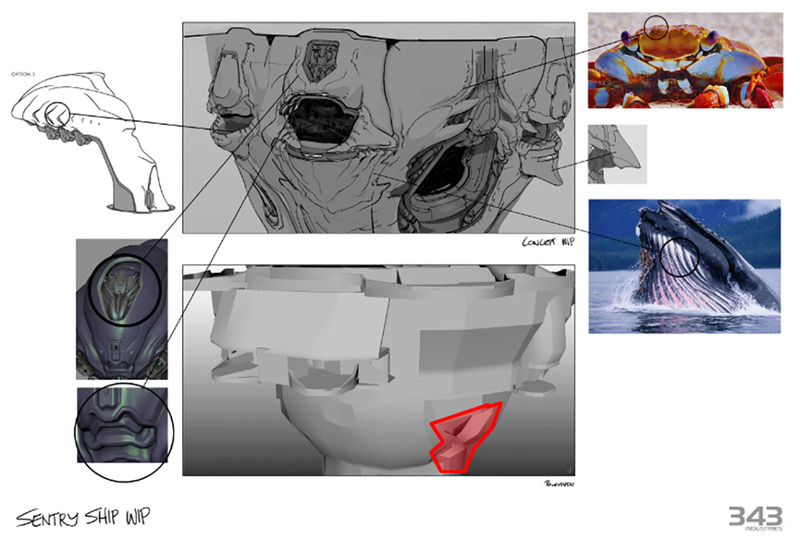 In order to make it work and give us the visual fidelity and threat we were looking for, the model had to go through multiple revisions. These changes not only made the Kraken more appealing and dangerous looking, but it also allowed for a better range of claw movement. We got extra pieces that we used as secondary movement to sell weight and to keep the movement interesting. Those things go a long way when you’re limited to a certain speed due to size. The Kraken can’t move too quickly or it feels unnatural, lighter, and smaller in size. Moving the Kraken too slow would cause the player to fully outpace it, and it would place the kraken out of view, so we made a conscious effort to keep the Kraken within the player view while maintaining consistency of it’s speed. This was very important to get it right early. But the challenges didn’t stop there. We also had to plan how such a massive vehicle would cause destruction as it took off or landed. We looked at how the rocks would break, what kind of debris is left behind. Do we want this in or out of the gameplay areas? How does lighting affect it? Can we do everything we want to do without lowering our frames per second? What about adding other smaller vehicles around it and keep the environment busy? There were so many questions we had to answer at different times of production that it was a big group effort to get this choreographed. Any change we did affected multiple teams and everyone had to be conscious of it. As challenging as this was, we learned valuable lessons and we were able to be flexible enough to react to changes that were needed in order to deliver the experience Halo players deserve. The end result is something we’re all proud of. It’s a set piece and a memorable moment of the game. Creating the Sangheli home world was a great chance to break away from what you would traditionally see and experience in a Halo game. Visually, I wanted to create an art palette for Sangehlios that would be unique and leave a sense of intrigue and mystery for the player, akin to the first Halo games. Bringing the player into the ancient ruins of the Elites and letting the player explore these ruins was a rewarding experience for myself. I must say that my love and intrigue with ancient civilizations combined with my childhood obsession with the of sense of adventure in Indiana Jones had a lot of influence on Sanghelios. While I’m very proud of the blend of art and gameplay that you'll find on the Sanghelios missions, during the development of the missions I often found myself exploring the world without any combat. This also meant creating a natural organic art palate for the world that was visually unique and appealing, but also fun to use the Spartan abilities in. The Sanghelios team was actually able to make a 15-mile hike through The Narrows in Zion National Park (pictured right) which not only gave us great reference for the natural looks and feel of the large canyons and valleys, but it also gave us a great feel for how it felt to traverse over boulders, climbing down waterfalls, clambering up ledges and rock walls and just about anything else that was probably way too dangerous to be doing on a “work” trip. Quite often we would have to use elements in the canyon to get up to other areas. 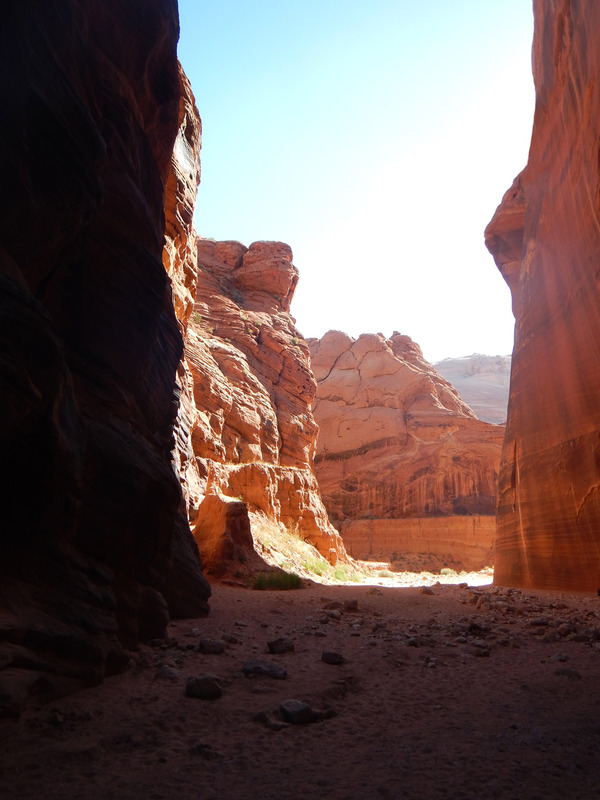 I remember feeling a great sense of adventure when we did that hike because it was just myself, and other team members, hiking miles through canyons and riverbeds with no one around. I’m confident that players who love the sense of adventure in their Halo games will have a great time finding areas of interest throughout Sanghelios....though often they'll have to make full use of their Spartan abilities to get to every point in the environment. Halo 5 for me was by far the tightest blend of design and art that I've ever experienced in my career. In order to fully bring out the Spartan Abilities and how you can use them to play through the environments, design and art really had to approach the layout of the missions and how elements were being used together. Early in production when we first started playing with Spartan Abilities, there were lots of run up to an object, get flush with it, jump, clamber and grab the ledge and repeat. 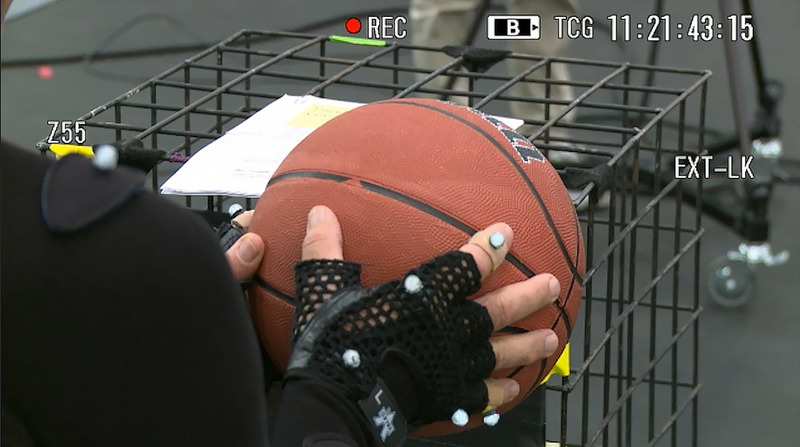 The abilities were cool, but if we laid out the level in a traditional Halo way, it created lots of points where your motion was completely stopped. This felt jarring to say the least. One of my biggest influences for how the art could enhance the gameplay was the old Tony Hawk games. Back in college, my roommates and I would play all-night sessions of Tony Hawk. I always enjoyed the seamless nature of how my skater transitioned from moves and onto new elements in the environment. I wanted that seamless gameplay to transition into how the player would use their Spartan Abilities to traverse through the environment. So together with design, when I was building out the Sangheli ancient ruins pieces, we played around extensively with how the pieces could be laid out in order to replicate the feel of constant motion. I didn’t want players to approach a combat space and think of the elements laid out as just “cover” objects. Instead I wanted players to take a longer look at how the elements are spaced out, their angles, and how elements can be used together. Throughout both “Enemy Lines” and “Swords of Sanghelios” there are many areas where the player can be in constant motion. From sprinting up a fallen over pillar, jumping off the tip of that pillar onto another platform that angled so the player keeps running, over a line of enemies, hovering for second...and then Ground Pounding them before they ever knew what hit them. The player can easily use the decayed ruins to run and boost their way up to rock ledges and upper platforms that give them access to flank the enemy without ever needing to stop their motion. We hope you enjoy these changes, and look forward to hearing your thoughts. 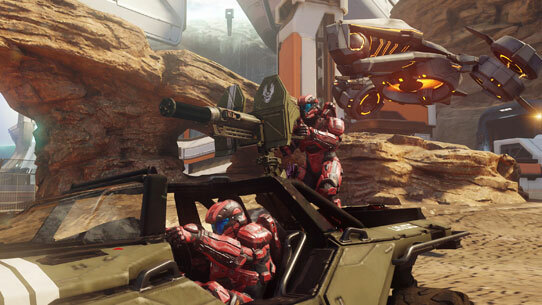 The playlist team is continuing to review feedback, and currently looking at improvements to the Big Team Battle and Team Slayer playlists, trying out several rotational playlists including a 4v4 Halo: CE playlist, and more. Tuning of these systems is nearly complete, and we look forward to sharing the full details on these and other improvements very soon, as the team works to set a final release date. We’ll provide status updates each week until release. This week’s play is a classic move performed on a remastered map. If you played a fair bit of Halo 2 Classic, you likely remember this maneuver, which is the Big Team Battle equivalent of the TDT cap. In this clip, HAL0 M4N and friends (guy mandude66, its Bibz, & Nobelnaga) perform a near-flawless execution on the Warthog-hood-assisted-triple-totem, with a perfect getaway just as the enemy catches onto their mischief. Total flag cap time? 48 seconds. Our friends over at ForgeHub have hosted another round of their Forge contest series, and the final winner just happened to be announced today. We’ve kept an eye on the finalists, and wanted to give them the spotlight. To give you a breakdown of the contest, here’s famed Forger Psychoduck, who has also thrown together some quick video overviews of each winner. ForgeHub and HaloCustoms have partnered up to host the third installment in the Meet Your Maker forge contest series. This contest focused on maps designed for 5v5 capture the flag play. The goal was for participants to create experiences which incorporate vehicles into more traditional core Halo gameplay and to maximize the interaction between infantry and vehicles in a tighter, more refined setting than traditionally seen in Big Team Battle maps. The community came together and built some incredible maps, but these three stood above the rest. Thanks to everyone who participated in the contest! Entrenched uses natural terrain in unique ways to create a space that is both very drivable and packed with vertical overlap. The higher attacker base compared to the lower defender base creates an interesting dynamic where flag pulls are often contested over long periods of time on the way back to the base. The long, open platform at offense base serves to prevent easy captures, requiring that defense team has control of the major power positions to be able to score. Blockus is a 1 Flag CTF map that provides a really balanced interchange between infantry and vehicular spaces. The trenches along the map and overarching terrain provide unique ways to bring those battle interactions together. The map was originally inspired by High Ground and attempts were made to invert some core design pillars to create an entirely new experience. The flow pattern is created by two figure-eights with well crafted sight lines and route restrictions. Blockus provided enjoyable gameplay from the initial testing lobbies and significantly improved over time from the feedback provided. The trenches on the map provide great direction for infantry movement and tossing up the flag through the hole is one of the most rewarding experiences when picked up by your teammates and captured. The dynamic combination of running the flag solo through mid trench and requiring a hand off to teammates was really interesting for us. Unearthed is a one-way symmetrical squad map designed for Multi Flag CTF. The map is sloped horizontally when facing out the bases to create interesting power positions and open key lines of sight on the map. Each bunker styled base contains a sniper and a Warthog. Rockets are placed on the highest peak of the map with an Overshield in the depths of the caves. The map's terrain and structural route restrictions generate a basic horseshoe shaped vehicle path. While simplicity may be your first reaction, the vehicle paths can be broken up by a combination of creativity and a Class A vehicle license. Maneuvering and jumping with the Warthog on Unearthed can be a rewarding experience as you can effectively change the expected course of arrival to the enemy base. We've enjoyed Unearthed from the moment we first played it. Balance, strategy, team coordination, beauty, you name it...Unearthed has it all, while providing an interesting and entertaining objective experience. We’d like to congratulate each of the winners in this contest, and encourage you to grab the maps from their File Shares – just press “A” while hovering over your name in the in-game MCC roster, navigate to “Find Player,” and search for the corresponding gamertag. That’ll do for this week. The next time we talk, it’ll be October, and less than a month until the launch of Halo 5: Guardians. I hope you’ll join us then. p.s. Whether you’re a football fan or not, be sure to tune into Sunday Night Football this weekend.